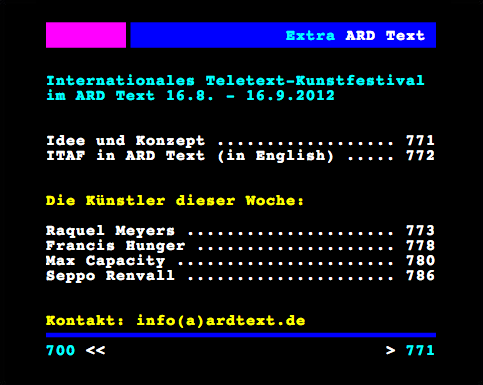 16th august-16th september 2012 / INTERNATIONAL TELETEXT ART FESTIVAL ITAF in ARD TEXT page > 770. 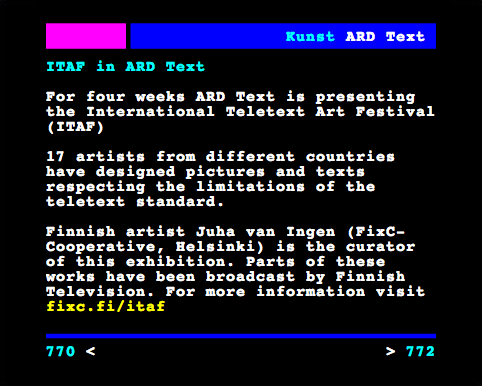 The International Teletext Art Festival is a FixC cooperative project in collaboration with ARD Text. The works were shown in ARD Text on page 770 and at Pflüger68. Participating artists: Ashley Anderson, Bym, Frederic Cambus, Max Capacity, Cordula Ditz, Maria Duncker, Dan Farrimond, Kathrin Günter, Francis Hunger, Juha van Ingen, Raquel Meyers, Dave Needham, Rich Oglesby, Seppo Renvall, Janne Suni, Jarkko Räsänen and Kari Yli-Annala.